When it comes to commercial asphalt paving in Tampa, some business owners are understandably unaware of the basics of the industry. If you own any sort of commercial property in the greater Tampa Bay area, you can benefit from understanding the basics of asphalt paving and maintenance. Parking lots should be inspected from time to time to verify condition and safety. Property owners and managers are encouraged to walk the entirety of their parking lot to look for cracks and other flaws. If previously existing cracks have since expanded or if new ones have formed, it is time for repairs In general, cracks between a quarter-inch and a full inch in width should be crack sealed right away. Even if the cracks on your property have not reached this width, it is better to address the looming problem right now rather than wait until it worsens in the future. Take a close look at your parking lot or other paved space for signs of puddling water. If you spot any water accumulating or if there are full-blown puddles, your lot does not have proper drainage. Commercial asphalt paving services will alter the slope of your lot and/or add drains to prevent water from accumulating and causing the formation of potholes and/or cracks. Furthermore, professionals will look for indications that there are problems looming below the surface. Any sign of sinking is cause for concern and should be addressed right away. 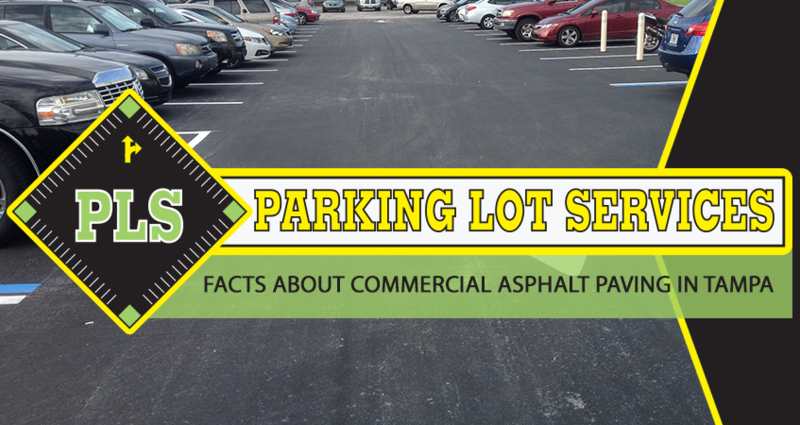 Your parking lot will prove confusing and dangerous if the arrows, lines, lettering, and symbols painted on the surface are fading away or have completely disappeared due to wear and tear over the years. People need clearly marked parking lots, entryways, and exit points to traverse these cramped spaces in an orderly and safe manner. Commercial parking lot maintenance will refresh these markings so your customers and employees are provided with clear guidance from the moment they enter your lot until the moment they exit. When it comes to commercial asphalt repair and paving in Tampa, no one does it better than PLS. Contact PLS today to get the ball rolling on your commercial asphalt paving services in Tampa. You can reach PLS at (813) 563-6189.